Ever heard of the SureCall Fusion5? It's a commercial-grade signal booster for big businesses that boosts 3G & 4G LTE signal strength. Despite all the cell towers popping up all over the country, cell signals still need to reach inside your home or office (since many of us make our calls and use our phones indoors). However, building material like concrete, glass, metal and energy-efficient construction weaken cell signals. So if you're deep inside your office building, getting good signal is a bit of a challenge. That's why companies like Chrysler, HP and Exxon Mobile depend on a cell phone signal booster to get better reception. And the SureCall Fusion5 is one the more powerful and popular solutions. But not resting on their laurels, SureCall has managed to bring that same power for big business to the home. Introducing the SureCall Fusion5s, just released this month. Same commercial power of the Fusion 5 but at a much cheaper price point for the everyday consumer. SureCall has a great reputation for providing well-built signal boosters. All their boosters are made of metal and not plastic. This helps with dissipating heat which helps internal components last much longer and avoids overheating issues. Hold a SureCall amplifier in your hands and you'll definitely feel the robust weight and construction. The Fusion 5s boosts talk, text, 3G and 4G LTE up to 6,000 sq ft. 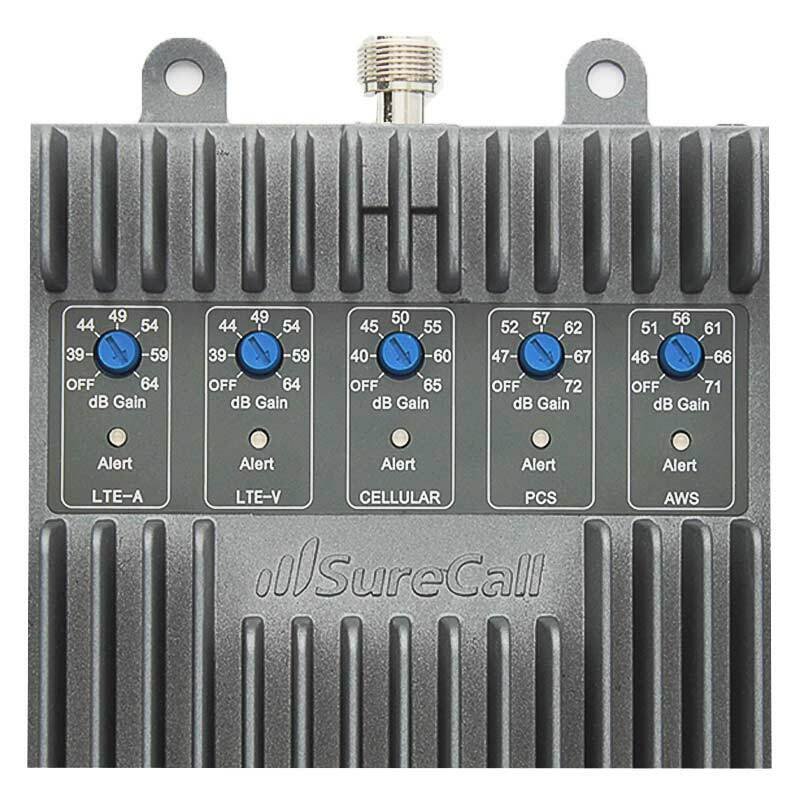 While some cell phone signal booster manufacturers may be generous with sq ft coverage (usually in a best case scenario), SureCall is the most accurate with their listings and ratings. The booster also features adjustable gain knobs for precise dB (decibel) gain. This is a nice feature, because some signals may be stronger than others and don't need to be boosted as much. Think of a concert and the audience members in it. If you're in the front row and near the singer, do you need the speakers to be on full blast (unless you like not hearing for a full week)? However, if you're in the back row, full blast would be perfect. With adjustable gain knobs, let's say if the Verizon signal is ok, you only need to boost it a little. If the AT&T signal is terrible, then it needs the maximum boost. But I know what you're going to ask, why not give maximum boost to all signals good or bad? It's the same reason why you don't dump a whole box of soap in the washing machine. The same reason you don't use a whole tube of toothpaste to brush your teeth. The same reason you don't use a beach towel to wipe up a small spill. More isn't always better. It's about precision. In the case of signal boosters, too much signal creates a feedback loop. In laymen's terms, it means the inside antenna is broadcasting so strongly that the outside antenna starts to pick up signal from it instead of the cell tower. So think of a snake eating its own tail. Pertaining to signal, this is called oscillation or feedback. From a consumer signal booster standpoint, there is only one other popular product that compares to the SureCall Fusion5s. The weBoost 471104 Connect 4G-X(formerly Wilson 461104 AG Pro Quint) is also a big winner. Both are the most powerful home units that SureCall and weBoost offer. Honestly, you can't go wrong with one or the other. Both are legally maxed by FCC standards. Although the weBoost Connect 4G-X can cover up to 10,000 sq ft, it's usually a best case scenario. Both units should be similarly powered. The slight advantage would go to Fusion5 for being cheaper and having a better amplifier housing design. However, the Connect 4G-X features automatic gain and has a longer history. At SignalBoosters.com, we provide 3G & 4G cell phone signal boosters for all homes, buildings, and offices. Email (sales@signalboosters.com) or call us (1-800-568-2723) about any cellular issues you're having and a signal expert will gladly assist you. Strong signals are out there and you're not getting it! And you're already paying these monthly carrier bills. Get the signal you deserve!